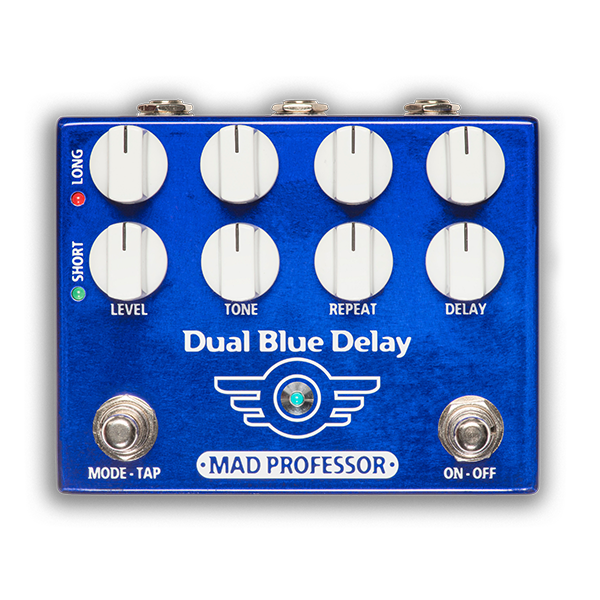 Simplified Dual Blue Delay with only multi head delay and short / slap back delay modes. Dual Blue Delay with Esa Pulliainen mod. One of the most well known Finnish guitar heroes, Esa Pulliainen, loved the warm and rich tones from the Dual Blue Delay, but did not need all the features the pedal has. Esa needs only a multi head delay and a slap/short delay to impress and touch every heart in the audience. We simplified the pedal by removing all the other features except for the Esa´s favorites. So with the Dual Blue Delay / Esa Pulliainen mod you can toggle easy and fast between the two of his favorite delay sounds: multi head delay and the slap/short delay. Upper row of knobs are for dialing the multi head delay and the lower row of knobs are for dialing the short delay. And you can toggle between the two delays simply by pressing the MODE-TAP switch. Suomalainen kitaralegenda Esa Pulliainen ihastui Dual Blue Delay rikkaaseen sointiin, mutta ei tarvitse kaikkia toimintoja mitä pedaali tarjoaa. Niinpä teimme Esalle version, jossa voi vaihdella kätevästi ja nopeasti multi head kaiun ja lyhyen slap back kaiun välillä.